Mayor de Blasio is expected to announce today the rollout of a ten-year plan to improve the city’s debt-and-disrepair-riddled public housing. According to the New York Times, plan items include–perhaps most notably–the leasing of land within a number of housing complexes to developers; other items include the transference of some New York City Housing Authority (NYCHA) employees (and the $90 million a year it costs the agency to pay them) to other city agencies and increased rents as well as higher parking fees for residents. Notable items the mayor’s plan include the leasing of land within a number of housing complexes to developers. A similar proposal by Mayor Bloomberg several years ago led to a public uproar amid fears that it would lead to privatization of public housing and was strongly opposed by Mr. De Blasio, who was public advocate at the time, though the earlier plan differed in that it only required that 20 percent of units be lower-income affordable. The measure is expected to raise $500 million in the ten year period. Under the current proposal, half of the rental units in new buildings would rent at market rates and the other half would be affordable to low-income households (defined as earning no more than 60 percent of the area median income). 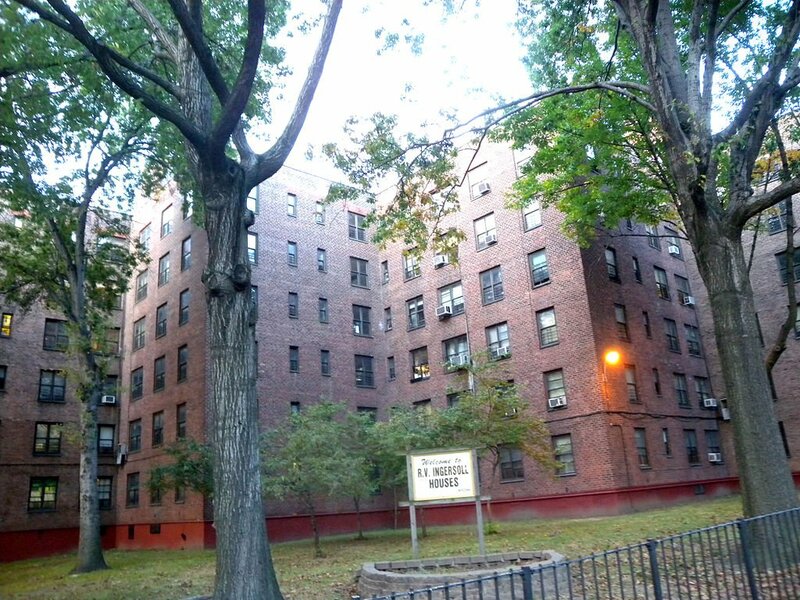 Additionally, the NYCHA would give land to developers to build 10,000 low-rent apartments (which would count toward the mayor’s 80,000 affordable unit goal), starting at Van Dyke and Ingersoll in Brooklyn and Mill Brook in the Bronx, in exchange for $200 million in fees over 10 years. NYCHA Ingersoll Houses in Brooklyn. Also proposed is the shifting of 14,000 apartments in a severe state of disrepair to other federal housing programs that allow private companies to pitch in for repairs. Federal officials say worries about creeping privatization are unfounded because, under housing program rules, a controlling interest would continue to be held by the city and that the city would merely be getting up to par with public housing agencies in many other cities that use those programs to “cope with federal disinvestment.” Other items in the plan include the elimination of a customer call center; residents would call general 311 lines instead for repair requests and complaints. Michael Dardia, former deputy director of the city’s Office of Management and Budget and current director of research at the Citizens Budget Commission was quoted as saying the plan is “very feasible” and could, “very well succeed in helping the Housing Authority operate in the black in a few years.” Dardia noted that some of the measures outlined in the mayor’s plan are “not going to be popular,” but that they were what was needed if the city is to provide subsidized housing.